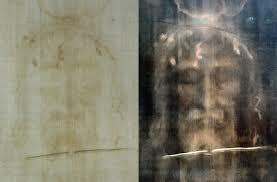 A question for Stephen Jones re his so-called “wounds” on the Shroud (not to be confused with bloodstains) | Is the Shroud of Turin really some kind of supernatural photographic 'selfie'? 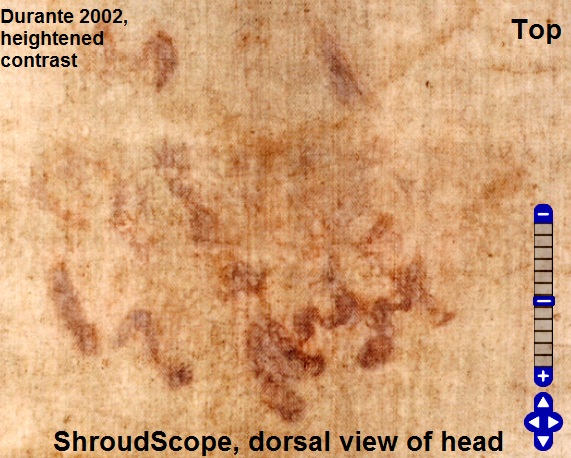 ← Time maybe for a radical re-jigging of the scorch model – and of the alleged superficiality of the Shroud image too? 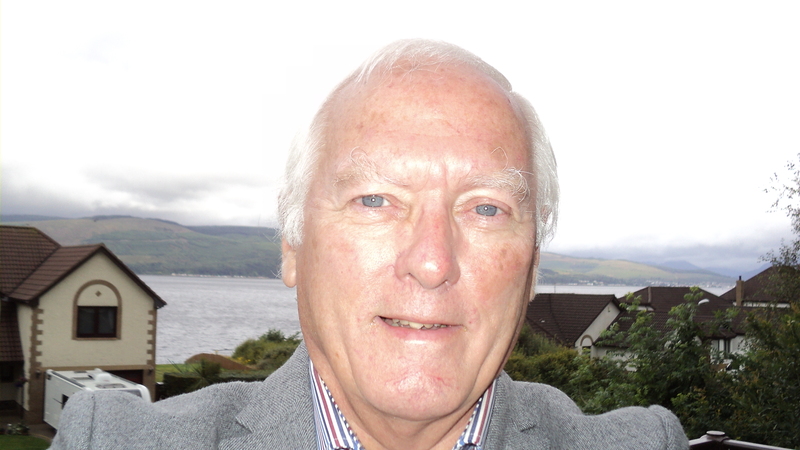 Stephen Jones: your latest post focuses on “wounds” and bloodstains on the Shroud. (See also Dan Porter’s current posting which alerted me to it). Nowhere do you define what you mean by “wound”, yet you use the terms “wounds” and “bloodstains” interchangeably. Here’s a conundrum to consider. Given that received wisdom is that bloodstains were acquired before body image, and there is allegedly no body image under bloodstains (thinking of Heller and Adler’s much-cited though less-than-conclusive experiment with proteolytic enzyme) then how can there be any imprinting of a wound (one that is not merely a smudge of blood, that is) ? Any wound-imprinting would have to be ON TOP of a bloodstain. Please show a wound imprint that you think is on top of a bloodstain…. Late addition: one is not thinking here of sites where the blood has clearly flowed, or assumed to have flowed, a sizeable distance, say those complex trails and patterns on mid and upper forearms, well away from the site of supposed nail wound(s). One is thinking of situations where there is no compelling evidence for thinking blood has flowed very far from the site of a putative wound, i.e. where the blood is highly prominent, yet no corresponding wound site is apparent within a realistic distance (e.g. the blood on the back of the head/hair – but no apparent wounds from a “crown of thorns”). Do I hear the riposte that the wound would be concealed by hair? Maybe, but it is Stephen Jones who claims there are thorn wounds visible, not I/me (sorry, my English grammar advisor has just popped out) . It is hardly scientific to claim that the latter are visible if they are not, and that the reason one cannot see them is because they are hidden by hair. To be scientific, one has to dump the term “wound” and replace it with “putative wound”. 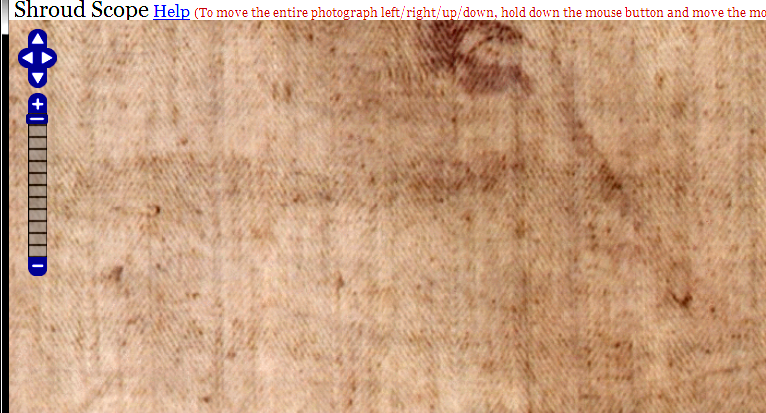 But the Shroud image without its bloodstains (faked?) , with no visible wounds, just “putative wounds” is simply an image of a naked man with crossed hands protecting modesty. Where’s the evidence, lacking blood (fake?) or wounds (not there) that the man in the Shroud had ever been crucified, far less in a highly distinctive fashion? Who’s to say the Man in the Shroud was not a purpose-made image, created for a reason one can only guess at, of someone who may have been tortured or otherwise abused, but had never been subject to such heavily (overdone?) scourging, to crown of thorns, or nails or spear wound? The Shroud of the Unknown Martyr? Bloodstains, real or simulated, yes, but where are the scalp wounds from the crown of thorns? Please show one of more examples of “wounds” on the Shroud that are definitely NOT accountable for as “mere” bloodstains. 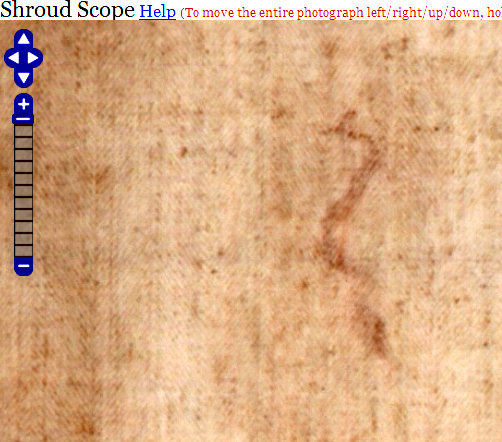 (I personally have spent many hours with Shroud Scope, and have failed to find a single feature of the faint and fuzzy body image that looks unequivocally like a wound, or laceration, or scourge mark – and indeed have repudiated Fanti’s claim to see a spear wound above the location of the bloodstain it is alleged to have produced). Professor Fanti himself acknowledges that so-called “scourge marks”, dumb-bell-shaped ones included, are in fact a subset of “bloodstains”. Oh, and if there were no genuine wounds on the Shroud, as distinct from bloodstains, then who is to say that a medieval forger did not simply paint on some blood (or blood-substitute) in strategic places, chosen to “corroborate” the Biblical account, so as to convey an impression of wounds? This entry was posted in medieval hoax, Shroud of Turin and tagged bloodstains, Fanti, scourge marks, Shroud, spear wound, Stephen E.Jones, wounds. Bookmark the permalink.